Ross, Rolheiser and Hogaboam-Gray (1999) define collaborative action research as “a systematic inquiry into teacher practice that is conducted by a team of teachers and university researchers working as equal partners” (256). One model of collaborative action research that is particularly well suited to mathematics education is Lesson Study, a systematic inquiry into teaching practice. 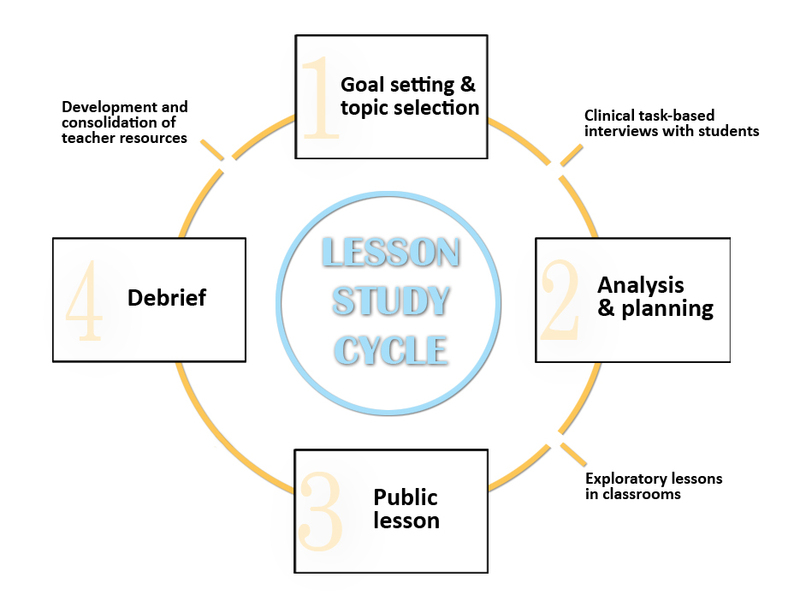 Lesson Study is an intensive professional development model where teachers and researchers collaborate to identify a problem area, plan a lesson to address the problem, implement the lesson and assess the effects. This process is repeated in iterative cycles of refinement, working toward a public research lesson (Murata, 2011). Lesson Study is directly relevant to both teachers and researchers interested in children’s mathematics learning because the professional learning activities are embedded in the classroom, focused on students and on difficult mathematics concepts (Bruce et al., 2010) and as a result are directly relevant to day-to-day teaching practice and its challenges (Lewis, Perry & Murata, 2006). Figure 1 depicts the major stages in the Lesson Study process that teams enacted. Clinical interviews or task-based interviews were conducted with some students in each class in the study. Teachers and researchers worked together to generate several precise mathematics tasks and related key questions in order to learn more about what students were thinking and understanding about mathematics – directly in the topic area that was self-selected by the teams. The interviews were videotaped and then reviewed by the Lesson Study team to help set some specific learning goals for students. Figure 2. A Kindergarten teacher conducting a clinical interview with a JK student. One key learning from the clinical interviews was that students, at a very early age, were capable of much more than anticipated and they used their intuitions and prior informal learning experiences to accomplish the tasks set out for them in the task-based interviews. We conducted the clinical interviews and we also examined some research on children’s number sense and usage of the number line. After watching video footage of the clinical interviews, we were especially intrigued by our students’ innate ability to manipulate the number line despite not being exposed to it in any prior lessons. Therefore, we decided to narrow our focus on the number line as a mathematical thinking tool to help students develop concepts such as relative quantity, cardinality, and spacing/intervals. - Lesson Study team describing the influence of clinical interviews. In this study, we encouraged teacher teams to develop lesson ideas that were innovative and somewhat tentative in order to explore teaching and learning activities in a playful way. The Lesson Study teams in this project placed priority these exploratory lessons (co-planned lessons to experiment with teaching strategies and materials with an effort to determine what students know, understand and can do, or how they respond to a particular intervention). These exploratory lessons provided the teams with the opportunity to test out hypotheses about teaching and learning mathematics related to precise content in mathematics. The use of experimentation and exploration engendered a culture of risk-taking amongst the teacher-researcher team. Teachers played with different lesson ideas, and refined these lessons (including tools, strategies and structures) based on student feedback and collective critical reflection. This enabled the team to dig deeper into the mathematics content and math goals for learning. It also fostered risk-taking during the public research lesson as the teachers and researchers approached the public lesson as yet another larger opportunity to learn more about how children learn mathematics. The second benefit of prioritizing exploratory lessons was that it not only validated but also amplified the cyclical nature of the Lesson Study process. The teams engaged in approximately six cycles of planning, implementing, reflecting and refining mathematics lessons in an iterative process. We have gained insight into how exploratory lessons activate smaller cycles within the larger Lesson Study cycle.